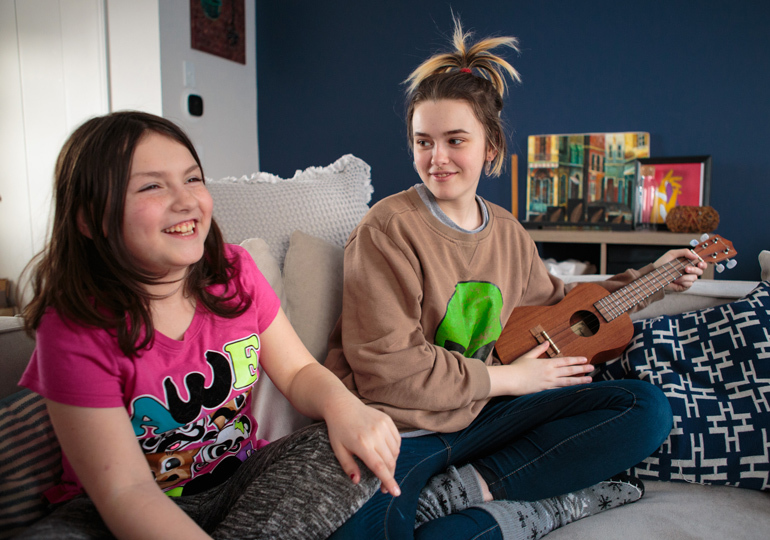 Sixteen-year-old Sam is in grade 11 and is a self-taught ukulele player, who has even composed a few original songs along the way! If you met the family five years ago, their story would’ve been dramatically different. And while they have been on a difficult journey, it’s also a journey full of strength and resilience. In 2014, Gina made the difficult decision to leave an unhealthy marriage. After facing domestic violence, she quickly found herself in a women’s shelter, as she had nowhere else to turn. The family had moved to Calgary from B.C. just a few months earlier, so Gina didn't have family or a support network to fall back on. “We left with nothing but two backpacks of clothing to our names and our love for each other,” Gina says. She was determined to provide a better life for her kids, but the family still struggled. Gina had been a stay-at-home mother for more than 10 years and didn’t have income or savings of her own to fall back on. The family felt fortunate to find a small two-bedroom apartment with schools for Audrey and Sam within walking distance. “I still remember our first meal in our new place, eating a picnic dinner on a blanket off the kitchen floor because we couldn’t even afford a table,” Gina recalls. 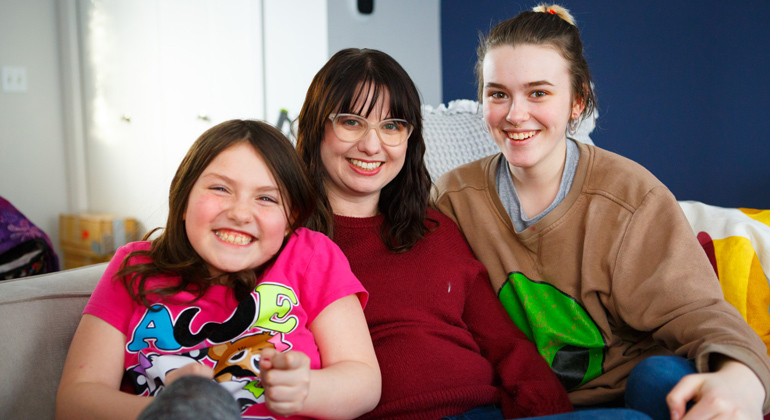 Resilient, they started to put their home together with the help of donations from the Calgary Women’s Shelter and thrifty second-hand finds that helped them get back on their feet. For three years Gina hunted for stable employment, working part-time as an esthetician and then part-time as a receptionist before finally securing a full-time job. For the past two years, she’s been working as a customer service agent at a local insurance company that she loves, and says that she is “forever grateful” for the opportunity to provide for her children. And while Gina and her kids felt fortunate that their lives had stabilized, everyday life still had its challenges. The family was living in a small rental in a neighbourhood that felt unsafe. Gina’s car had been broken into and her mail had been stolen on multiple occasions. 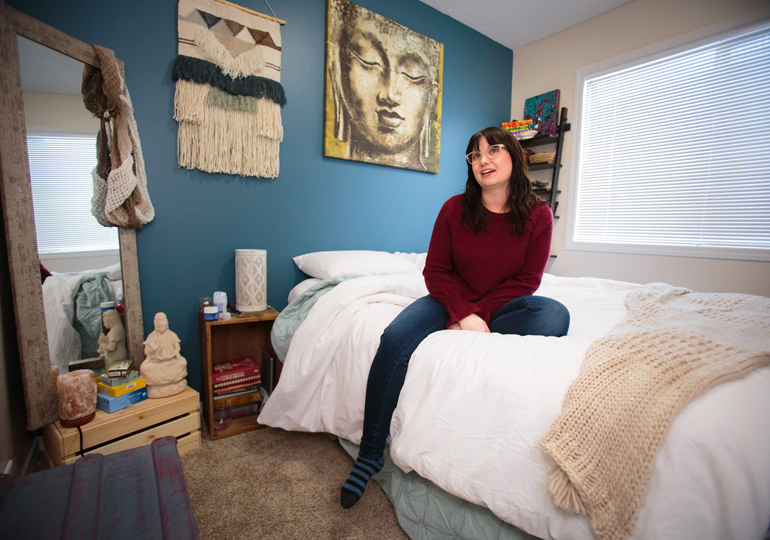 To maintain stability, the family chose to stay in their small rental, and Gina gave the master bedroom to her kids to share, and slept in the smaller room in their apartment. “While we are a close family, my children are as unique as they are different, and they were both so excited to have a room of their own,” Gina says. 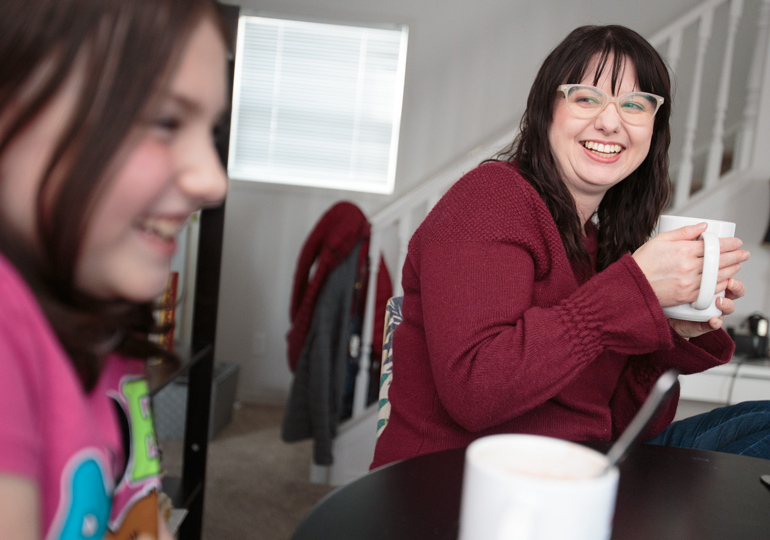 Gina’s worked hard to build a new life for her children, setting aside savings, rebuilding her credit, budgeting and finding bargains on furniture to make their house feel more like a home. “And I've done it by myself,” she says with pride. Even after making those positive strides, Gina felt hopeless that she would ever be able to buy a home and put down new roots for her family. With housing costs eating up nearly half of her monthly pay cheque, saving for a down payment was simply out of reach. But that hopelessness soon turned into joy and excitement when they were approved to buy a home through Habitat. 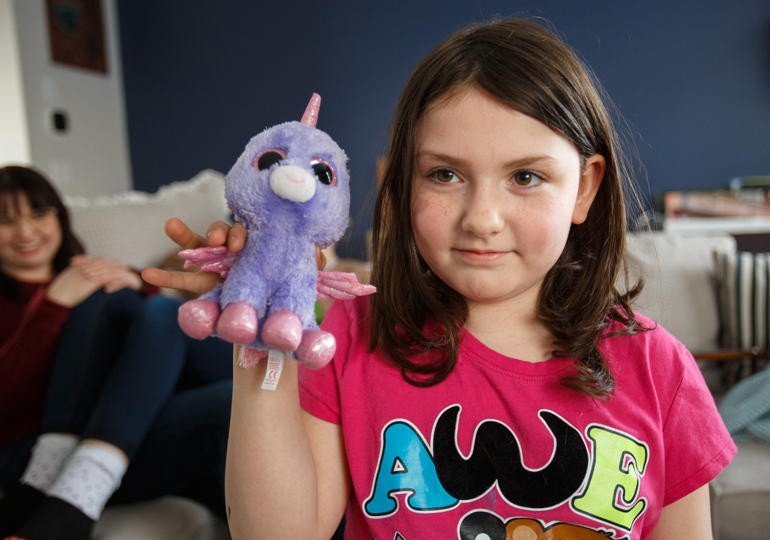 “I am so happy that Audrey is still young enough that one day she will be able to say, “I grew up in that house,’” Gina says. Gina was approved to buy her home in early 2018, and shortly after, began working on her 500 volunteer hours. She fit the hours around her full-time job by volunteering on weekends, with incredible support from her family and friends at work. Audrey got to be part of it to by making cards, and even had her artwork featured on a mug! 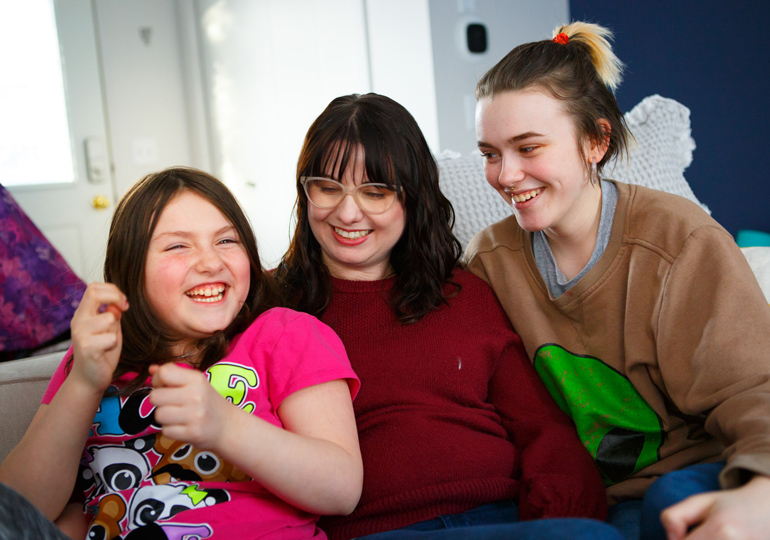 On January 25, 2019, Gina, Audrey and Sam opened the door - literally - to a new life. The day was full of jitters, excitement and a lot of heavy lifting. For both Audrey and Sam, the biggest improvements so far have been in having their own space and privacy. Being just a couple months into home ownership, the feelings of excitement and stability are still fresh. 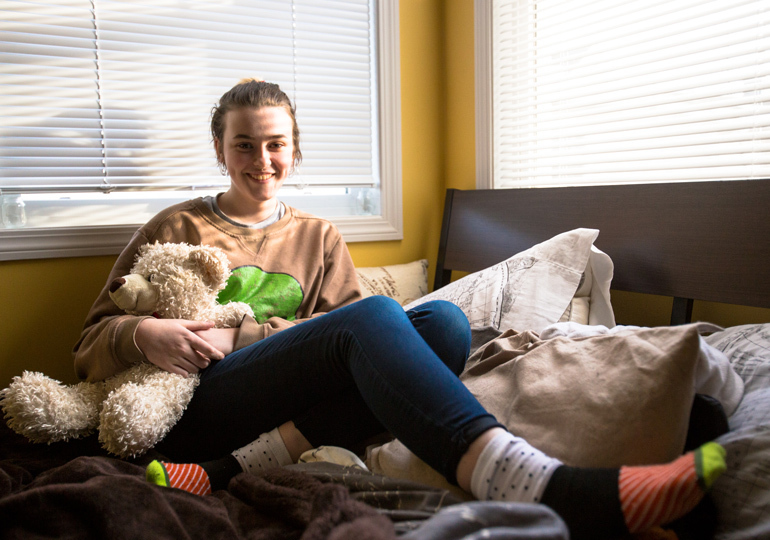 “On weekends, I wake up, have a cup of tea and just soak it all in,” Gina says. Looking to the future, the family is focused on simply being in a state of comfort and happiness.